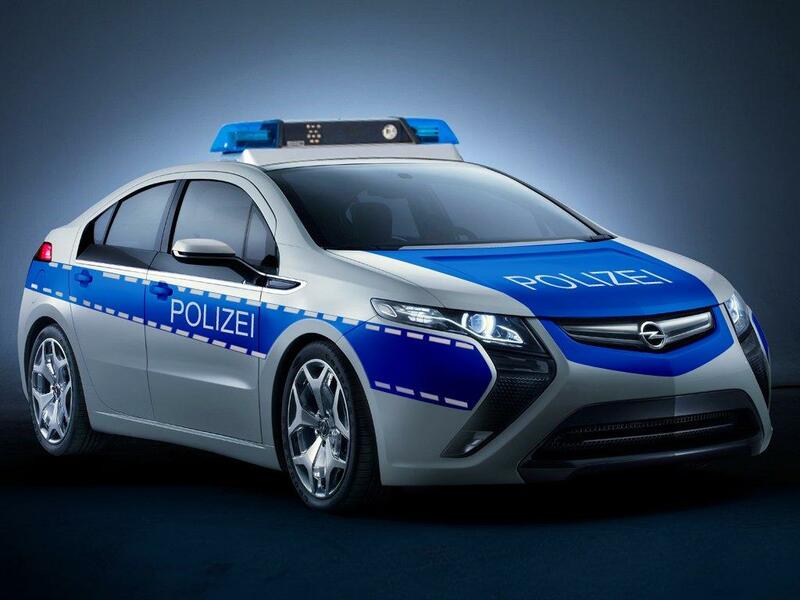 Opel touts the electric Ampera police cruiser as a good car for silent, undercover work. The German automaker, keen to begin selling the Ampera to police forces in Germany, has dressed the Ampera in police blue and proclaimed its advantages as a patrol car. The Opel Ampera will have a range of between 40 and 80 km (25 to 50 miles) running solely on electric power, reliable for patrolling city neighborhoods. A 1.4 liter gasoline engine then kicks in and can extend its range to around 500 km (310 miles), which means a police chase doesn't have to end embarrassingly for the good guys. It's healthy 370 Nm of torque helps it do the 0 to 100 km/h sprint in an okay 9.0 seconds and the Ampera can reach a top speed of 160 km/h (99 mph). The Ampera is powered by a 16-kWh lithium-ion battery feeding current to an electric motor that produces 111 kW (150 hp / 152 PS) and 370 Nm (273 lb-ft) of torque. The battery can be recharged using a 230 V outlet in around 4 hours. The Opel Ampera is priced at €42,900 in Germany with a net cost of €36,050 to buyers when including government tax-credits. It is available for order now with deliveries set to start at the end of the year (2011).